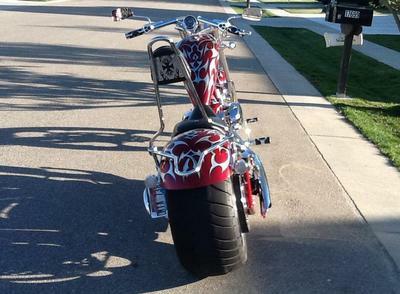 The 2006 Big Dog K-9 Chopper for sale is equipped with a 117 CI S&S motor with a Baker 6 speed transmission, a 300 rear tire, a two up seat, sissy bar with a luggage rack, Vance and Hines big radius exhaust pipes, engine oil cooler, stash tube, and two inch foot peg extenders. I also have a cover that will go over it (not a Big Dog motorcycle cover). The Big Dog k9 is in immaculate condition with low mileage of 7136 well maintained miles. 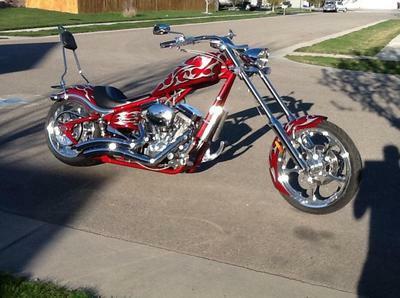 This chopper has one of the better paint jobs from Big Dog. 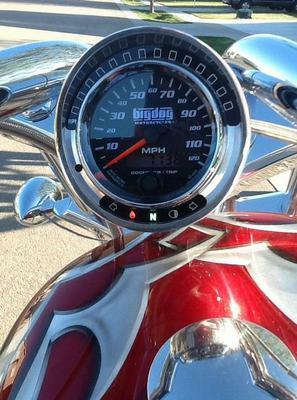 The paint color is red with tribal accents that turns heads everywhere I ride the bike. I hate to sell this chopper as it has been my pride and joy but having kids changes a person's priorities. If you have any questions regarding the K9 or if you would like to make an appointment to see it in person or make payment and pick up you can get in touch with me using the form below and please mention that you found my Big Dog Chopper motorcycle classified on GoGoCycles Used Motorcycles for Sale . GoGoCycles would also encourage our biker friends to write a review of this custom motorcycle or share any thoughts and/or opinions to make potential buyers aware of any problems that are commonly associated with this brand or to highlight its positive features and help our visitors make informed decisions. In my opinion there is not a better deal on a custom chopper for sale as this one around, on Craigslist or in an Ebay auction so hurry and make an offer before this beauty gets away from you! 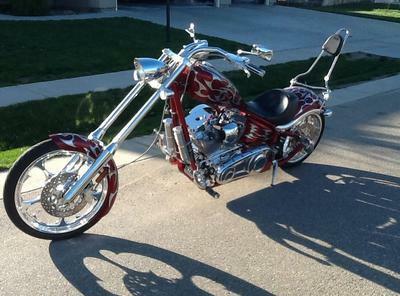 The 2006 Big Dog K-9 Chopper for Sale is in New York NY 10081 USA and is sold as is with no warranty. Email before the K9's gone and don't forget to mention that you found this ad on GoGoCycles Motorcycle Classifieds www.gogocycles.com using the comments forms located on this page.